You can now customize your own lanyards, id holders and badge holders. Have them custom printed and delivered in record time. This is our full range of custom lanyards, they include printed, woven, earth friendly and even custom molded PVC options. We don't compromise on quality and our pricing and turnaround time is second to none! 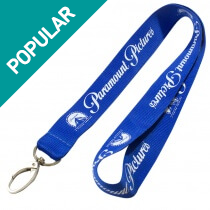 If you find a lower price on an identical customized lanyard within the USA we will beat it! 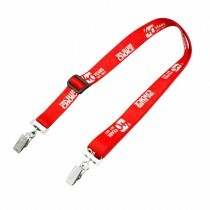 Are you in need of premium custom lanyards, what about matching access cards for your corporate event. Don't want to sacrifice quality for price? If so, you have come to the right place. You'll get amazing products and affordable prices, all accompanied by our unrivaled service. Choose from old favorites, such as nylon and polyester, in custom colors, or opt for something more exotic, such as a dye sublimation lanyard featuring a photographic print and satin insert with logo branding. We offer five day rush premium shipping anywhere in the country on selected options and a price match guarantee. You can rest assured knowing you are getting a quality product at a great price from the premier lanyard printer in the country. 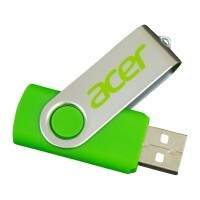 You may find certain companies offer these items at incredibly low prices. 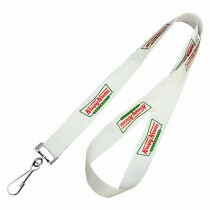 They make use of a repeat lanyard printer and use a roll of machine printed material. As a result, logos and other important information, such as the company name, may not print correctly, they may be cut off or they may be sewn through. 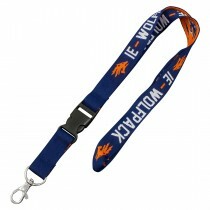 When this happens, the company or organization does not get the desired premium finish of their custom lanyards. We can't stress enough that this is NOT how we print. All of our products are specially screen printed by a technician so that they are crisp, clear and well placed. Because we use this precision screen printing method during the production process. Our type of lanyard features a raised texture and is appropriate for static text and designs with a maximum of 4 print colors. It doesn't sound like many colors but you would be surprised just how amazing a one to two color print can turn out. Customers may choose between single and double sided printing. First, we cut the material to the appropriate size and then we position a single screen on this pre-cut length of material. This is all done before the lanyards are printed and sewn together to ensure no information is lost on the final item. 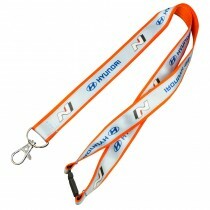 In addition, customers may choose dye sublimated lanyards. This style incorporates vibrant colors that are heat transferred on hi-def fabric, using a four color process to produce a texture that is silky and smooth. This lanyard is colorfast, thus lanyards that need to be washed frequently last longer when this option is selected. Why is the choice of printing technique of importance? 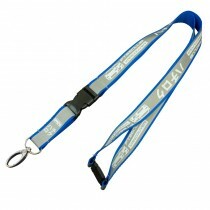 Custom lanyards serve as a form of advertising for your company. 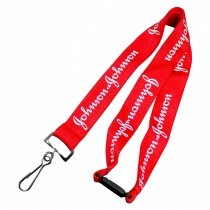 When potential customers see your lanyards at events or trade shows, what impression do they get? A cheaply made lanyard suggests you don't care enough about your advertising to invest more in this area, and the consumer may wonder if you cut corners in other areas. This needn't be a concern when you work with us. Everything we produce will show your company in its best light. How do we ensure this? We work with clients at every stage of the process to ensure complete satisfaction. The process begins when you request a free quote. You then provide us with your logo and we do a free virtual proof and mockup to make certain you are 100% happy with the lanyard and badge holder combination you have selected. Only when this design has been approved will the production process begin, and we handle all aspects of the manufacturing. We have our own factory to guarantee the quality of each product delivered. 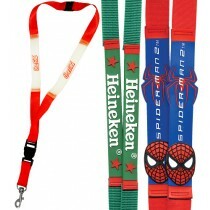 For customers who need assistance in designing personalized lanyards, we can be of help here also. Any promotional company worth their salt will employ a staff of graphic designers who can assist clients in creating the perfect lanyard. And we are no exception. In addition, we offer recommendations on the thickness of the material, the fittings to be used and more. You aren't alone in the design process, as we understand how important these products are in terms of representing your overall organization. When a design has been chosen, along with the various elements of the lanyard, we complete a virtual proof sheet and mockup. With these items, customers see exactly what they will get when their order arrives. There is no confusion and any problems may be addressed before production begins. Not only does this save time, it helps to keep costs down, and we pass these savings on to our customers. 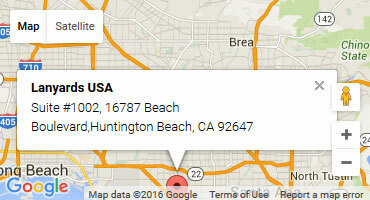 Once you have approved your free virtual proof, your order heads to our production facility. Having our own facility guarantees that the order is produced right the very first time. Nothing is more frustrating than waiting to receive a lanyard and badge holder order for an event, only to have them arrive and they aren't as expected, even after approving the virtual proof and mock up. Thanks to the multi-step process we use, all of which is conducted in house, this is never an issue when you choose to work with us. We offer countless options, as we understand your company has specific needs. Select from a variety of materials, a number of fittings or a combination of fittings. 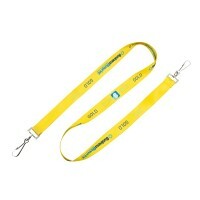 As a premier lanyard company we also offer safety breakaway clips for OHS. Let us know what items or devices will be attached to our products and we'll help you find the best clips, whether it be split rings, a bulldog clip, a plastic hook or other attachment completely. In addition, we offer a range of material widths. Select from 1/4" all the way up to 2", although we do recommend a 1/8" or 1" material width on most products. 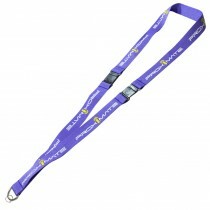 Not only are these the most comfortable for the person wearing the lanyard, they offer the best in terms of branding opportunities. We want you to get the most for the money you are spending and will work with you to ensure you do. Be sure to explore the numerous options available, including flat polyester lanyards, duoflex lanyards, recycled P.E.T lanyards and bamboo fiber lanyards. Select the one that best represents your brand and its value and request a quote. We'll respond promptly with a firm, written quote along with the turnaround time and a free artwork. The sooner you start this process, the sooner you will have your new items in hand ready to share with others. 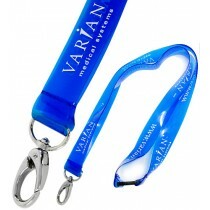 We also offer other products that may be of benefit along with your custom lanyards. Consider ID cards, pet leads and collars, camera straps and more. We even stock conference supplies to make your life easier. 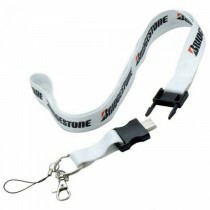 Why work with multiple suppliers when you can come to us for your lanyards and other promotional items? We strive to make your life easier in every way.